waiting for a friend from high school- actually a friend from facebook who was an aquaintance in high school. 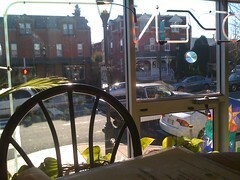 this is a really cute place in west reading- penn ave in general is pretty cute. and it was so awesome to be on my own. i am NEVER on my own in reading, i felt very free. i hate so badly there is no bus by my dad's house.